Hardwood Flooring Blue Ridge Contractors Inc.
Blue Ridge Hardwood Flooring Inc.
Blue Ridge Hardwood Flooring Inc. specializes in custom hardwood floors with over 40 years combined experience servicing Colorado. A division of Blue Ridge Contractors Inc, this family owned business built its reputation around two things: fine craftsmanship and our collaborative approach with designers and architects. Everyone at Blue Ridge Hardwood Flooring Inc. works together to deliver an exceptional product on schedule and on budget. Paired with Blue Ridge Contractors Inc, we can now offer a total in-house experience allowing the customer peace of mind with regard to budgeting, scheduling, custom flooring, painting, trim, and interior / exterior remodels. We look forward to working with you and your family! Multiple species of hardwood are available including oak, walnut, hickory, maple, mahogany, and cherry to name a few. When you look closely, these beautiful woods offer a depth of character all their own. Let us be your guides, we offer vast knowledge and resources of every species, both exotic and domestic. If you know what you want, great! If you dont, we're more than happy to assist you in your selection. Walnut is unquestionably the finest wood in the world. Our forefathers sought it out and used it lavishly in their homes, barns and fences. The warm brown wood finishes beautifully. It is easy to work, yet durable. It shrinks and swells less than any other wood, which makes it an excellent choice for flooring. Hickory Pecan trees are widely known for their sweet edible nuts that are used in candies and pastries. Pecan trees grow mainly in the southern Mississippi Valley, as far west as central Texas to southern Georgia. Hickory Pecan wood is known for its fine-grained beauty, strength and durability. Uses include paneling, cabinetry, furniture, veneer and flooring. 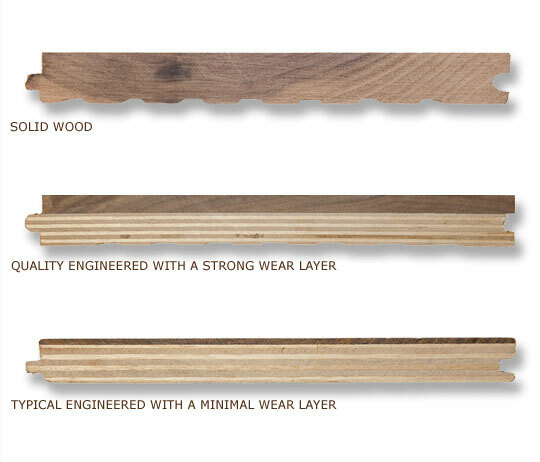 The classification “Exotics” is used to describe imported woods. Exotics usually refers to expensive and increasingly rare hardwoods from tropical regions, including Africa and Polynesia. Exotic woods swing in a wide range of applications, from musical instruments, cabinetry, pool cues to incredibly beautiful wood floors. Whether it's new construction or a remodeling project, our highly trained hardwood flooring specialist can help you create the look you desire in your home. We offer a free on-site consultation that will allow us to walk you through the many different species of wood and show you how you can make your hardwood floors unique through various installation techniques, borders, medallions, parquetry, and inlays. Blue Ridge Hardwood Flooring Inc. uses the latest equipment and proven techniques to sand your old floors and bring them back to life. When your hardwood floor needs a facelift you can count on our hardwood flooring specialists to do the job right. Hardwood is perhaps the most practical of all flooring materials. This is the prime reason for applying a modern new finish that can even make hardwood floors much easier to maintain than when they were originally installed. We have the knowledge and experience to give your wood flooring a quality finish. Damage to hardwood floors can easily be repaired by a hardwood flooring professional; split or cracked wood, gaps in the planks, buckling, cupped floors, warped hardwood floors, and more. Bringing in a professional hardwood installer to re-install your flooring properly is probably the only sure way to permanently solve your problem. Many families are upgrading their carpeted staircases to hardwood staircases. They are easy to clean, look beautiful and are featured in many homes across the country. If you want an updated look, then updating your carpeted staircase to hardwood could be the project that you are looking for.This project takes precision cutting, skills and expertise. Proper installation of hardwood flooring doesn't stop with installing the floors- among other factors to complement your new flooring would be custom trim. Finding the right professional to do the finishing touches is just as important as any other part of the job and can make the difference between a good finished product and a great one! Once you’ve decided to install or refinish a wood floor, you may wonder what will happen next? Knowing what to expect during, and after the work is completed will help ensure a high-quality finished product. - For new installations, the wood will need to acclimate, which will vary from five days to two weeks. - If your floors are being sanded, finished or refinished- be prepared for some noise and disruption. Dust containment systems can minimize debris, but no system is 100% effective, so cover any items that you want to keep dust-free. When the finish is applied, stay off your floors until it has dried for at least two days. The time required will vary depending on the type of finish used. - After the finish has dried, put felt pads on the bottoms of all furniture to minimize scratches and dents. Place scatter rugs at all entrances, avoiding those with rubber backs, which can discolor your floor. Avoid walking on your floors with cleats or high heels in disrepair. Keep in mind that no two floors will be identical. Variations in wood appearance are completely normal and expected. As your floor ages, some color change may occur. This is normal but can be minimized by limiting exposure to direct sunlight and periodically moving furniture and rugs. Cracks are normal as well and will appear and disappear between floor boards during seasons of high and low humidity. For more information about hardwood flooring and to schedule your FREE consultation and estimate Contact Us Today!